Are you allowed to wear two tartans? Another question often asked is "can I wear two tartans"? The answer is yes you can, there are no hard and fast rules or regulations governing the wearing of clan tartans. 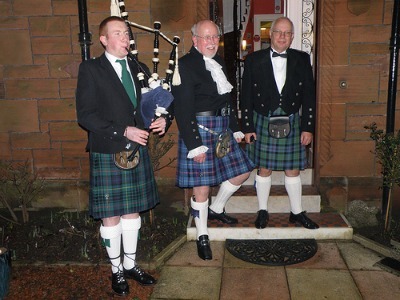 Many traditionalists believe you must be a clan member to have the right to wear the clan tartan. This is simply not true, lots of people wear two tartans Prince Charles is a good example, as he is often photographed wearing different tartans. Another common situation is when someone chooses to wear their mothers family tartan, as well as their fathers. I thought long and hard before deciding on the tartan for my own kilt, finally opting to go with my fathers because it is predominantly green, which happens to be my favourite colour. Below I have some photos, which help illustrate how you can wear two or more different tartans. 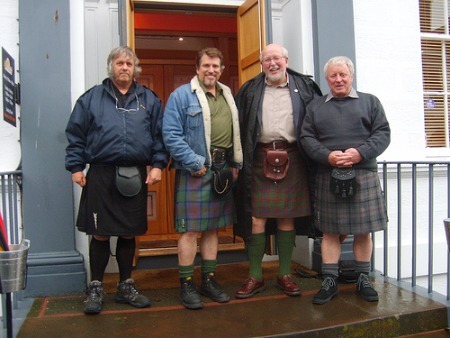 Note that the same Gentleman is in all four photos, wearing a different tartan each time. 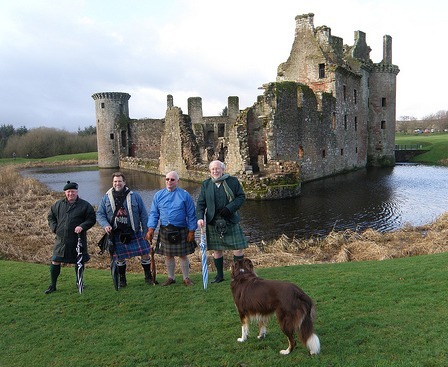 The next photo shows the Gentleman wearing yet a third different tartan, with a Scottish castle as a backdrop. You will notice that all these photos are taken by Alex Cunningham and there are lots more of his photos throughout the website. 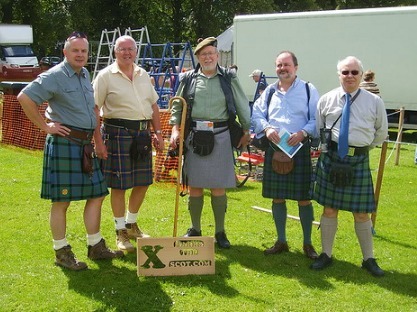 The last photo shows the Gentleman with a group of friends, and yes he is wearing yet another different kilt. So as you have seen, wearing two different tartans is perfectly acceptable. Traditionally many Scottish Regiments and those of the Commonwealth have their own tartans, which naturally allows the soldiers serving with these regiments to wear two tartans, their regimental and their family tartan. All units associated with the British Royal Family wear the Royal Stewart Tartan, this is of course regardless of whether they have family connections to the Stewart clan or not. And the Royal Family themselves wear the Balmoral tartan, which was designed for them as they have their official Scottish residence there. In fact the Royal Stewart Tartan is more commonly seen at Scottish weddings, than any other Tartan, the reason being that when men hire Highland Dress for a wedding (which they do more and more often these days) Royal Stewart is the most popular choice. So the tartan you choose for your kilt is simply your personal choice, and my advice would be to choose what you like and don't allow anyone else to tell you what you can or can't wear. Kilts are for anyone who wants to stand out from the crowd, they are both comfortable and fashionable and although they are not inexpensive, if you want to buy two different kilts in different tartans then simply do so. Perhaps one for casual wear and one for formal wear, the possibilities are endless, you decide. If you would like more information on this subject, you can drop me a line using the "Contact Us" page.